24 children from, the Wirral based charity, Stick 'n' Step, have recently enjoyed overnight stays at Barnstondale, a family friendly activity centre and overnight getaway destination based in the heart of rural Wirral. The aim of the trip was to bring the staff and children together to enjoy new activities and utilise what they have learnt whilst having lots of fun. It also showed the children's families the independence they have gained through the conductive education sessions they receive from Stick 'n' Step. Over the last two weeks of July, Stick 'n' Step took four groups of 6 children to Barnstondale. 4 conductors from Stick 'n' Step went with the children to lead the trips, organising the activities they would be involved in. Each group stayed for a day and a half and spent their time taking part in activities like archery, shooting and wall climbing. Barnstondale is an inclusive facility that allows children and adults of any ability to take part in the activities it offers. It provided the children and their families with the perfect environment to work together. Taking the children for trips away from the Stick 'n' Step centre has associated challenges, especially as some children with cerebral palsy experience symptoms of autism. This means that breaking their routine can be stressful and cause them to lose concentration when dealing with brand new distractions. 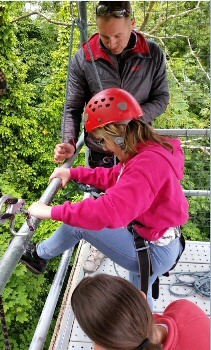 Trips like this are a great way for these children to learn to overcome these issues, which are things that occur in typical day to day life and allows them to develop their own independence, in a safe and fun environment, alongside their peers. Commented Sarah Smithson, Operations Manager at Stick 'n' Step:- "The trips to Barnstondale have allowed the children to practice what they have learnt this year at Stick 'n Step in a new environment. 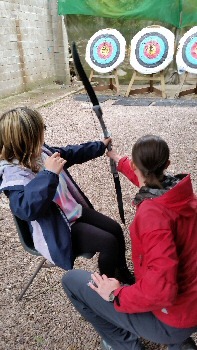 The children loved experiencing new activities, showing their families just how independent they are becoming. The conductors also enjoyed spending time with the children outside the centre, seeing exactly how they coped with the new environments and distractions. It's a great bonding opportunity for the charity and its beneficiaries and it was enjoyed by everyone who attended. We would like to thank Barnstondale for its hospitality over the 2 weeks." Stick 'n' Step provides free conductive education sessions, which are not offered by the NHS, to help children with cerebral palsy learn vital life skills, like walking and talking, through participating in group activities. It's a place where they can make friends and grow in confidence, and where parents have access to respite and support. Families travel each week from across the North West and North Wales to the Stick 'n' Step centre in Wallasey to receive this life changing service. Stick 'n' Step receives no government funding and relies completely on fundraising to cover its annual running cost of �350,000. For more information about Stick 'n' Step and how you can help, visit:- StickNStep.Org or call then on:- 0151 638 0888.